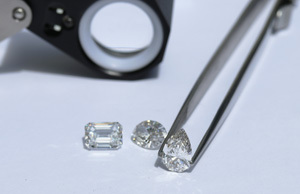 Lab Grown Diamonds: The Vegan Alternative. Stunning lab created diamonds that are easy on the environment are a core part of Ada's philosophy and we're proud to introduce our lab grown vegan diamonds. Our laboratory grown stones are not only chemically identical to mined diamonds, and are guaranteed conflict-free. Start your perfect proposal with a lab grown diamond engagement ring from Ada Diamonds. Learn about the 4c’s, and shop conflict-free diamond engagement ring styles. Should You Chooose a Cultured Diamond? Join the future of fine jewelry with a conflict free, lab grown diamond engagement ring. Learn about the 4c’s and shop engagement ring styles at Ada Diamonds.